This game is from the 2015 Samsung Cup, round of 32, group stage. It was played by Shi Yue 9p and Park Younghun 9p on September 8, 2015, in Beijing, China. Shi-Yue 9 dan (left) and Park Younghun 9 dan at the 2015 Samsung Cup. Shi Yue had been ranked #1 in China for more than a year, but Ke Jie 9p has been very powerful, and Shi Yue’s rank was down to #2 in September, 2015. His style of play is basically thick and solid, but he’s very tough and bold at fighting. He doesn’t play aggressively when he is ahead, but when he is behind or a battle begins, he changes himself into a fighting mode to becomes a strong warrior. Shi Yue isn’t only good at fighting, but also good second half of the game. At an interview in 2013, Lee Sedol said “Shi Yue is the toughest player to play against, because it’s hard to find his weaknesses”. He won the 17th LG Cup, by defeating Won Seongjin 9p in the final, in February 2013, and he’s still one of the most powerful players in the world today. In early November, he defeated Tang Weixing 9p in the semifinals of this Samsung Cup to proceed to the final. Park Younghun 9p is ranked #3 in Korea. Park won the 17th Fujitsu Cup in 2004 by defeating Yoda Norimoto 9p, and that was his first international title. With the victory, he became the youngest 9p in history in Korea. He also won the 1st Zhonghuan Cup by defeating O Rissei 9p in 2005, and he won the 20th Fujitsu Cup again by defeating Lee Changho 9p in 2007. After winning the Fujitsu Cup, he’s added quite a few of domestic titles, but his results in the international tournaments haven’t been impressive. His style of play is light and peaceful. He doesn’t rush, but tries to maintain the balance of the game. Park is very specialized at endgame and counting, so his general strategy is to maintain the balance of territory and power until the end of middle game. And then he can consolidate his winning games or try to reverse losing games in the endgame stage. He’s been struggling against fighting oriented style players for a while, but he’s been playing quite well in the middle game lately, and his rank has been going up to #3 in Korea just after Park Junghwan 9p and Lee Sedol 9p. Very recently, he proceeded to the final of the 20th LG Cup by defeating Tuo Jiaxi 9p. Anyway, their style of play is completely different, and let’s have a look at their game. Reviewing just after the game. Kang Dongyun 9p and Park Younghun 9p proceed to the final of the 20th LG Cup. The quarter finals and semifinals of the 20th LG Cup took place on November 16 and 18, 2015, in Gangwon, Korea. Kang Dongyun 9p and Park Younghun 9p defeated Shi Yue 9p and Tuo Jiaxi 9p in the semifinals respectively. The game between Kang Dongyun and Shi Yue was very exciting and spectacular along with the huge life and death situation over the center. Shi took the lead after a big trade in the center, but Kang magically reversed the game with a two step late ko. Meanwhile, Park Younghun had a nice opening aginst Tuo Jiaxi, and he leaded the game in his pace with his exquisite haengma. Tuo started to play aggressively afterwards, but Park maintained his lead through the middle game, and there were no chances for Tuo in the endgame against Park. The final will be played on early January, 2015, Korea. Park Younghun 9 dan (left) and Kang Dongyun 9 dan at an interview after their semifinals. Shi Yue 9 dan (left) and Kin Jiseok 9 dan, reviewing the game from the quarter finals. Shi Yue is ranked #2 in China, handing over the #. 1 position to Ke Jie 9p a couple of months ago. Recently, he defeated Tang Weixing 9p in the semifinal of the 2015 Samsung Cup by 2-1 to proceeded to the final. His opponent in the final is none other than Ke Jie, so the match will determine the first player who has won international Go tournaments more than once after Gu Li 9p. In Korea, he is widely known as an enthusiastic reader of Chinese classical books. In contrast, his style of play is very fierce, making him one of the most aggressive players in the world. He defeated Kim Jiseok 9p in the quarter finals, but he lost to Kang Dongyun in the semifinals. Kang Dongyun 9 dan (left) and Ke Jie 9 dan in the quarter finals. Kang Dongyun 9p is ranked #4 in Korea, and he defeated the Chinese #1 player Ke Jie at the quarter finals. As mentioned in the previous article, Ke Jie has been undefeated as white in his official games this year. However, in the game against Kang Dongyun, he chose to play Black although he had the right to select his preferred color. Despite complicated battles throughout the game, Kang managed to maintain his lead by a small margin until Ke resigned. Kang Dongyun’s victory was meaningful in that he checked Ke’s unstoppable pace in the international Go scene. Park Younghun 9 dan (left) and Yo Seiki 7 dan at the quarter finals. Park Younghun is ranked #3 in Korea overtaking players like Kim Jiseok 9p and Kang Dongyun 9p. He has performed very well in recent international tournaments. He defeated Chang Hao 9p and Zhou Ruiyang 9p to proceed to the semifinals of the 2nd MLily Cup in early September. At his young age, he quited playing as an Insei, and participated in amateur tournaments with a number of victories. His rank is the highest among the ‘baby cow trio’ which refers to Park Younghun, Won Seongjin, and Choi Cheolhan 9p, all of whom were born in 1985; the year of cow in zodiac. Park has been known as the endgame master after Lee Changho 9p. Won Seongjin 9 dan (left) and Tuo Jiaxi 9 dan at the quarter finals. 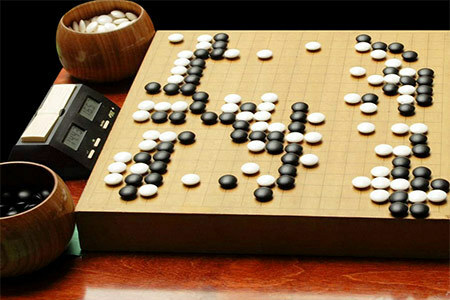 Tuo Jiaxi is ranked #6 in China and the winner of the 18th LG Cup in 2014. He also won several domestic tournaments in China. He seems to prefer unsettled fighting games and he is strong at close combat rather than peaceful game. He showed his power at fighting against Won Seongjin 9p in the quarter finals. However, there weren’t any good places for him to show his strength against Park Younghun in territorial game in the semifinals. The quarterfinal matches had a lot of interesting viewpoints. First, it represents current trends in the international Go scene well. Three pairs of Korean and Chinese players ran into each other, and it shows that the competition between the two countries is even. Yo Seiki (Taiwanese name – Yu Zhengqi) 7p was the only Japanese player, but he wasn’t able to overcome Park Younghun. All of the three games drew a lot of attention of Go fans as they are all top players in their countries. Kang Dongyun, Shi Yue and Tuo Jiaxi defeated Ke Jie, Kim Jiseok and Won Seongjin respectively. The LG Cup is a major international Go tournament. It started in 1996 and the prize money is currently 300 million Won (approximately $270,000 USD at the time of writing). The runner up receives 100 million Won. The main draw of 32 players is part invitational, comprising of 5 Korean players, 5 Chinese players, 4 Japanese players, 1 Taiwanese player and including the previous year’s winner and runner up. The rest of the main draw is determined through a preliminary tournament. The format is single knockout, with the final played as a best of three games. The tournament is sponsored by LG Electronics, a multinational consumer electronics company whose headquarters are in South Korea. Kang Dongyun 9 dan (left) and Shi Yue 9 dan at the semifinals from the 20th LG Cup. Park Younghun 9 dan (left) and Tuo Jiaxi 9 dan at the semifinals from the 20th LG Cup. Yu Zhiying 5p defeated Park Jieun 9p in the final of the 6th Bingsheng Cup, on October 21, 2015. The final was played in Suzhou, China, and Yu won by 2.5 points after 260 moves. Yu Zhiying 5 dan (left) and Park Jieun 9 dan at the final of the 6th Bingsheng Cup. Yu Zhiying is currently ranked number one in China in women’s Go, and she’s in fine form. It was very sensational that she defeated Mok Jinseok 9p and Choi Cheolhan 9p at the group stage of 2015 Samsung Cup. Defeating Choi by half a point was very particularly impressive! Choi Jung 6 dan (left) and Yu Zhiying 5 dan at the semifinals of the 6th Bingsheng Cup. Yu earned her spot in the semifinal by defeating Zhang Zhengping 3p (Taiwan) in the round of 16 and Wang Jing Yi 2p (Japan) in the quarter final. She faced Choi Jung 6p in the semifinal match. Choi is the defending champion and currently ranked number one in Korea in women’s Go. Yu and Choi are rivals and currently two of the strongest players in the women’s Go. Their head to head record before this match was 6-5 for Yu’s favor. Yu defeated Choi in six consecutive games from the middle of 2013 to the end of 2014. However, it seems like Choi found Yu’s weak spot and narrowed Yu’s lead by winning their next four encounters in 2015. The game between Yu and Choi was an interesting contrast between Black’s (Yu) thickness and White’s territory. The game maintained its balance after early fighting and the score became very close. In the end, Black’s thickness prevailed in the endgame, and Yu went on to face Park Jieun 9p in the final. Li He 5 dan (left) and Park Jieun 9 dan, at the 6th Bingsheng Cup. Park Jieun used to dominate women’s Go in Korea along with Rui Naiwei 9p but her results haven’t been as impressive in recent years. She’s won four international tournaments in her career including the 1st and 2nd Bingsheng Cup in 2010 and 2011. She defeated Rui by 1.5 point in the round of 16, and ousted Wang Chenxing 5p, the winner of the 4th Bingsheng Cup, in the quarter finals. Park faced another former Bingsheng Cup champion, Li He 5p, in the semifinal. The game was full of tough and fierce fighting and Park was just able to save half a point to proceed to the final. The final against Park was another challenge for Yu. The head to head record between Yu and Park before this game was tied at 2-2. Yu Zhiying 5 dan (left) and Park Jieun 9 dan, at the end of the final game. The final started with calm and peaceful opening, which suited Yu’s style of play. Black (Park) started a tentative attack on White’s center stones, but her strategy wasn’t clear enough, and White successfully settled her weak groups with skillful sabaki. The game was still very close as it entered endgame, but White’s position was thicker than it appeared. Yu maintained her lead until the end with her excellent endgame technique. It was Yu Zhiying’s first international title! Congratulations! The Bingsheng Cup was first played in 2010 and is held annually at Qionglong Mountain, Suzhou, China. The original name of the tournament is the Qionglong Mountain Bingsheng Cup, and it’s sometimes referred to as the Qionglong Cup (in English) because of this. Currently the only women’s individual international Go tournament, it uses a knockout format for the top 16 players from China, Korea, Japan, Taiwan, Europe, North America and Oceania. Amateurs are allowed to take part if they win the right to represent their region. The time limit for games is 2 hours main time and 5 x 1 minute byo-yomi. The first prize is 250,000 RMB and the runner up receives 100,000 RMB. Qionglong Mountain is where Sun Zi (aka Sun Tzu) wrote The Art of War (孫子兵法), and is called the mountain of the wisdom. Bingsheng (兵圣) literally means ‘soldier saint’ – named in honor of Sun Zi. The second character also appears in the names of the Qisheng and Kisei (Go saint) tournaments. The 2nd Codecentric Go Challenge began on October 3, 2015, with the computer Go program Zen challenging 11 time German Go champion Franz-Josef Dickhut (aka FJ) in the first game of a best of five match. The Codecentric Go Challenge is an annual best of five match between a top computer Go program and a top amateur Go player. The first iteration of the tournament was held in 2014 and the event is sponsored by Codecentric – an IT consulting company based in Germany. In 2014, Dickhut defeated CrazyStone (another top Go AI) with a 3-1 score, after losing the first game. This year, he’s facing CrazyStone’s rival, Zen. Zen is the brainchild of two people – Yoji Ojima and Hideki Kato – who together form Team DeepZen, based in Japan. For this match, Zen19 is using a parallelized implementation of its code, developed by Hideki. This means that it can efficiently carry out many calculations simultaneously (in parallel) when it has access to a computer cluster (multiple computers at once). This version of Zen is stronger than the commercial version when clustered. an 8-core Core i7 5960X at 3 GHz, with 16 GB RAM. For more information about the match and to read an interview with both teams, please visit the Codecentric website. 11:00 PM Australian Eastern Daylight Time. You can watch the game on the KGS Go Server (look for the game between fj and Zen19S). More information about the match schedule is available here. Let’s have a look at the game! Zen computer Go program beats Takemiya Masaki with just 4 stones! The round of 16 and the quarter finals of the 2015 Samsung Cup took place on October 6 and 8, 2015. The venue was the very impressive Samsung Global Research and Development Center in Gyeonggi, Korea. Lunch each day was freshly cooked to order! It was a showdown between China and Korea, with Japanese, Taiwanese and American players eliminated in the group stage. Shi Yue 9p and Kim Jiseok 9p were facing each other, and that was the most interesting match in the round of 16. Kim has been in a long slump, and his haengma hasn’t been as sharp as before. Shi showed his strength, and he won the game relatively easily. Yu Zhiying 5p was the only female player in the round of 16, but she was no match for Lee Sedol 9p. Park Junghwan 9p, Ke Jie 9p and Byun Sangil 4p had little trouble defeating Zhou Hexi 5p, Na Hyun 6p and Gan Siyang 4p. Zhang Tao 4p overcame Park Younghun 9p, which was most the unexpected result from the round of 16. Park’s been doing really well lately, but he lost in the endgame, which was very uncharacteristic of him. Park Younghun 9 dan (left) lost unexpectedly to Zhang Tao 4 dan at the 2015 Samsung Cup. Tang Weixing 9p conquered Lee Changho 9p and that was a meaningful win for him. Lee Changho was winning until the quite late in the endgame, where a few mistakes cost him the game. This would have never happened back when he was unbeatable. The score became tied with China and Korea both entering the quarter finals with four players each. After a rest day, it was back to the Go board! Although not before some taking part in a yoga session to stretch out those tense muscles from the first day. The best way to prepare for a Go match is…yoga? Kim Dongho 4p didn’t seem convinced this is a good way to prepare for his quarter final appearance against Shi Yue 9p which unfortunately, proved to be correct for Kim. Zhang Tao 4p couldn’t manage to produce another upset which saw Lee Sedol 9p through to the semifinals. Tang Weixing 9p and Ke Jie 9p snapped up the other two spots in the semifinals by defeating Park Junghwan 9p and Byun Sangil 4p, respectively. When play resumes again in November, 2015, all of Korea’s hopes will be on Lee Sedol 9p who will face Ke Jie 9p. The other semifinal will be an all-China affair with Tang Weixing 9p and Shi Yue 9p hoping to make it through to the final. Black 19 to 31 were lively, but White 40 and 42 were well balanced moves. White 68 was the vital point, but the game was still even up to Black 81. Black 91 was wrong timed probe, and White took the lead with 92. White 118 to 122 were sophisticated, and White solidified his lead up to 146. Black 157 to 161 were a good move order to catch up. White 166 and 186 were small, and the game was getting closer. White 214 was the losing move, and that should be at Black 231. Black 27 and 29 were practical. White 32 was wrong direction, and the opening up to Black 37 was slightly better for Black. Black 43 to 45 were light haengma, and the result up to Black 59 was favorable for Black. Black 85 and 87 were brilliant, and White was in trouble. White saved his group up to 110, but Black’s got strong everywhere, and it was good enough for Black. Black 113 to 119 were gorgeous, and Black crystallized his lead. White didn’t grasp any chances to catch up afterwards. White 16 was warlike, and Black’s responses were cool up to 23. Black 31 was premature, but White 32 to 36 were a bit heavy. Black 45 to 49 were big, and White started to attack Black’s left side group from 50. Black 57 and 59 were practical, and the result up to Black 69 was satisfactory for Black. Black 73 to 83 were nice and strong, and Black was still in the lead. Black 99 to 109 were magnificent, and Black’s moves afterwards were perfect to finish the game. Iyama Yuta 9p successfully defended his Meijin title on October 6, 2015, defeating Takao Shinji 9p with a perfect 4-0 score in the 40th Meijin title match. Game 4 of the final was played on October 5 and 6 in Mie Prefecture, Japan and Iyama Yuta won by resignation after 227 moves. Takao Shinji 9 dan (left) and Iyama Yuta 9 dan at the 40th Meijin final. Iyama Yuta 9 dan at the 40th Meijin final. Having successfully defended the Meijin title again, Iyama currently holds four of the seven Japanese “majors”, including the Kisei, Honinbo and Gosei. Earlier this year, he also successfully defended three other titles, defeating Yamashita Keigo 9p in the 39th Kisei, 70th Honinbo, and the 40th Gosei title matches. Yamashita won three games in the Kisei title deciding match, but only managed one win each in the Honinbo and Gosei finals. This is the 5th Meijin title in Iyama’s career. Iyama first challenged Cho U 9p in the 33rd Meijin in 2008 but was defeated 4-3. However, Iyama got a second chance the following year in the 34th Meijin and won his first Meijin title with a 4-1 score. In 2010, Iyama defeated Takao Shinji 4-0 to successfully defend his title. However, his hold was short-lived and he lost to Yamashita Keigo 9p in 2011. In 2013, Iyama challenged Yamashita Keigo for the title back, and he won his third Meijin title with a 4-1 score. In 2014, Kono Rin 9p challenged, but Iyama defeated him 4-2 to defend the title. Takao Shinji 9 dan with the sealed move, at the end of the first day from game 4. At the end of 2014, Takao defeated Iyama to win the 40th Tengen with a 3-2 score. He was behind the final 2-1, but won the last two games to win the title. Takao’s style is calm but lively, and he favors tesuji and flexible haengma. Yamashita Keigo was soundly defeated by Iyama earlier this year, so some thought Takao’s style of play might be more effective against Iyama’s powerful and creative style of play. However, Takao didn’t manage to win a single game in the final so we can assume that it’s even harder for Takao to fight against Iyama. There are a few young talented Japanese players rising rapidly through the ranks such as Murakawa Daisuke 8p, Ida Atsushi 8p and Ichiriki Ryo 7p. Murakawa has already managed to win one title from Iyama with the 62nd Oza in 2014 and Ida is the youngest Judan holder. So the professional circuit in Japan is about to get a lot more interesting! Takao Shinji 9 dan (left) and Iyama Yuta 9 dan, at the beginning of game 4. The opening up to White 54 was even. White 58 to 60 were good probes, and White 66 and 68 were practical. Black 87 was premature, and White took the lead up to White 96. White 106 and 112 were nice moves to make eyeshape. White 142 and 146 were sharp, and decided the game. White 22 to 26 were nice, and the result up to White 32 was slightly more favorable for White. Black 35 to 37, Black 47 to 49 were full of fighting spirit. Black 73 to 77 were strong, and Black 89 and 103 were good tesuji. The big trade up to Black 123 was good for Black, and Black took the lead. White 170 was sharp, and White 182 was a nice way to reverse the game. White 200 was the losing move, and the game was reversed again up to Black 211. White 22 to 28 were creative moves by Iyama. Black 37 was questionable, and White 46 to 56 were sophisticated. White 82 was a nice counter-move, and the result up to White 92 was satisfactory for White. Black 97 to 103 were bold, but Iyama’s sabaki up to White 128 was excellent. Black went all out with 129, but White 140 and 142 were accurate, and Black’s center group was captured. White 22 and 24 were questionable, and Black had a nice start up to 31. Black 39 and 41 were a good combination, and Black 49 was a good tesuji as well. White 74 was slack, and Black solidified his lead with 77. Black 81 to 85 were creative, and Black 89 was practical. Black was still in the lead up to 123. Black 143 to 149 were severe, and Black 167 to 175 were strong and powerful. White 210 was tricky, but Black 211 and 213 were accurate, and simplified the game. Black 215 and 217 were played in precisely the right order, and the game was over.